40 years on from the first time his work was presented at hcmf//, we look back over the Sciarrino’s presence and performances at the Festival – including Richard Steinitz’s recollections of the time he didn’t turn up – and the time that he did! In 1985, the Arditti Quartet came to hcmf// for a concert that included, among other things, a new work by Salvatore Sciarrino: 1983’s Codex Purpureus. Describing the piece, Sciarrino has written of his hope for the music to capture ‘the emission left behind by sounds… which some call silence’. This profoundly elusive idea, of a phenomenal space between sound and nothingness, has become one of Sciarrino’s most defining characteristics. hcmf// 1985 provided the Festival’s first deep-diving focus on the iconic works of Sciarrino. The Arditti Quartet were joined at the festival by Divertimento Ensemble, who return, 33 years later, to perform new Sciarrino works at hcmf// 2018. 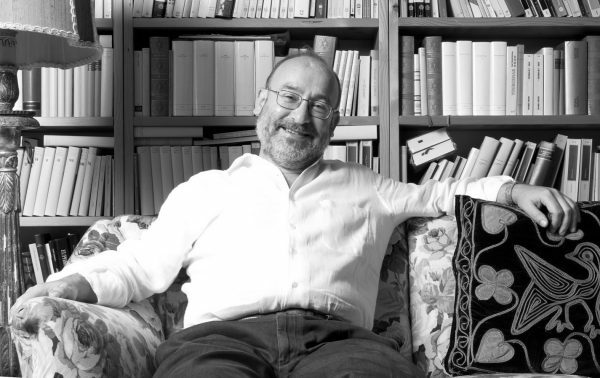 Their UK Premiere of Centauro Marino was an early moment in the development of a long-standing relationship with Sciarrino’s work – one that speaks to the great care with which these delicate, meticulous pieces must be handled. Alongside these performances were a series of works performed by flute innovator Roberto Fabbriciani and pianist Massimiliano Damerini, realising Sciarrino’s vision on an intimate scale. hcmf//’s founder, Richard Steinitz takes up the story: ‘For my eighth Festival as Artistic Director in 1985, I decided to focus on the music of a single country: Italy, where I had myself studied composition with Goffredo Petrassi. 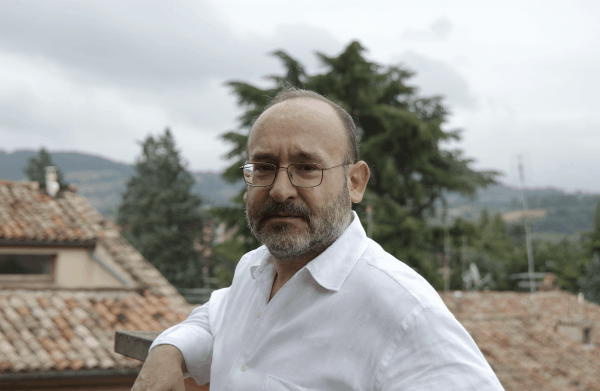 While it may seem steeped in methodology and big ideas, there is also something simple and accessible about Sciarrino’s work. The 2001 Salvatore Sciarrino: Portrait is evidence of this. Performed by a chamber group including Mario Caroli, Nicolas Hodges, Mieko Kanno and Garth Knox, the concert delivered works themed around tangible concepts and vivid imagery, considering night, death, and negative space. As Richard recollect, the 2001 Festival programme also included a performance from Kammerensemble of the immense music theatre work Lohengrin, showcasing Sciarrino’s interest in the social and communicative power of composition that is driven by narrative. But as contemporary music has changed shape, so has Sciarrino’s music. A feature concert of hcmf// 2004, Scanner.Scans.Sciarrino provided an alternate reality that questioned everything we know about his work. In this performance, electronic musician Robin Rimbaud took four meticulous Sciarrino works – spanning from 1987’s Trio no 2 to 1995’s Ommagio a Burri – and blitzed them. Conceived by Rimbaud and Sciarrino himself, this wilfully destructive project reimagined the composer’s work as a series of broken sequences and destroyed narratives. Using the alias Scanner – named for his approach to crafting electronic music with police tech and phone materials – Rimbaud developed a process that opened up new pathways for Sciarrino’s music. ‘Scanner can manipulate my music through his imagination’, Sciarrino wrote in his programme note, open to the change: ‘I offer him my music so that it can be transformed by his hands’. 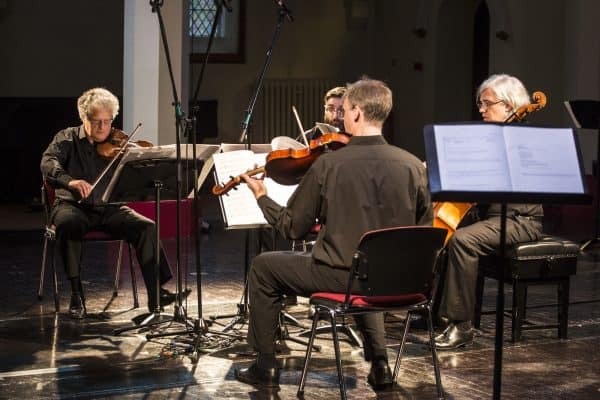 Ensemble Alter Ego, who performed alongside Rimbaud, noted the connective tissue between the styles of Rimbaud and Sciarrino: they both ‘eliminated the superfluous’ from their work, creating economical and sparse work that was all the more impressive for it. Sciarrino remains a vital composer who explores sound, and the places it is hiding, like no one else. Performances of his work have continued to define the landscape of contemporary music through the 21st century: the UK premiere of his work 12 Madrigals was a highlight of hcmf// 2008, an expansive song cycle that married the Japanese haiku of Matsuo Bashō to polyphonic sound. His compositions have since been performed by artists as esteemed as cellist Oliver Coates, percussionist Serge Vuille and flautist Erick Drescher. With a wide variety of ensembles coming together to perform new Sciarrino pieces, the 2018 edition of hcmf// continues to emphasise the legacy, impact, and versatility of an artist who has been played in Huddersfield music halls since 1978.